All text copyright of the Author, Photographs supplied by the Manufacturer. 1:76 scale model buses and coaches have always been at the heart of the public transport collectors scene. The scale is large enough to show considerable detail, but small enough to display a wide range of models in a limited space. Recent years have been a time of turmoil for model bus makers. Established names have released far fewer models. EFE, now under Bachmann‘s ownership, has only recently started to announce new upgraded models under the new management. At Hornby the Corgi Original Omnibus range continues to release models but many fewer than in previous years. This is in part due to the rapid rise of Oxford Diecast output in this market sector which has put a pressure on the prices and quality offered by the established players. Some smaller players like Forward Models continue to release their early post-war buses at a steady rate, and even add extra transfers to allow customisation of destination boards. The recent announcement of a Birmingham Guy Arab by Canadian firm Rapido Models will add stiff competition to that part of the marketplace. 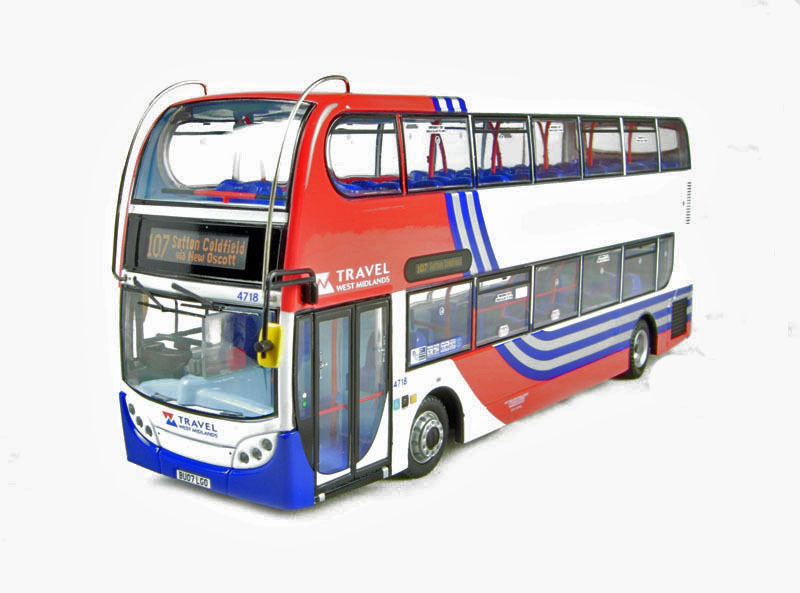 We have seen the loss of some other players in the market as Brit Bus and B-T Models went into liquidation in 2017 and although B-T Models seem to be being rescued I have not heard that Brit Bus will be. Northcord Model Company was formed by Danny Chan after the closure of CMNL in 2011. It has always aimed to produce detailed models to a high standard. 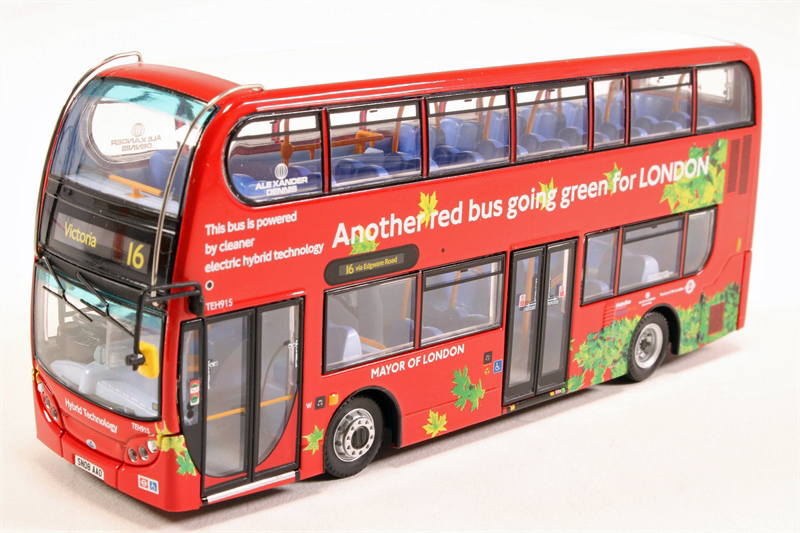 It makes careful use of moulds to produce buses from Australia, Ireland, North America, Hong Kong, Singapore, and the UK have all been featured in the range. 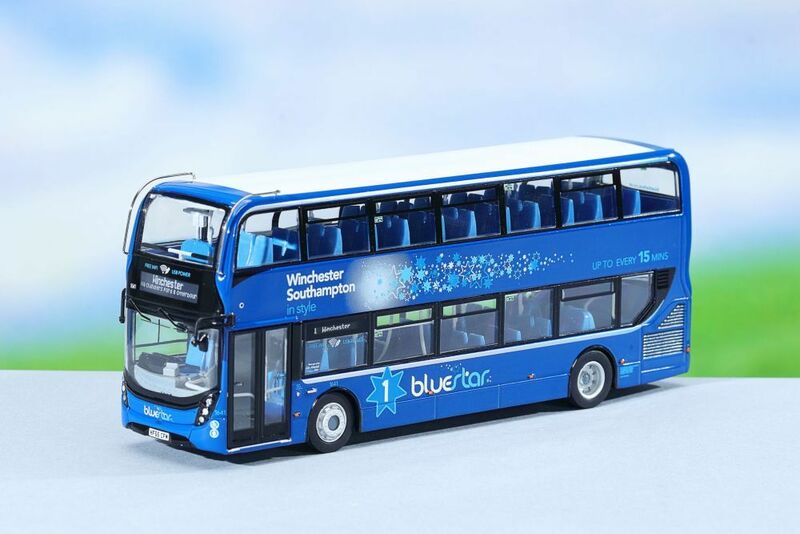 They will be now be releasing eighth and ninth versions – ukbus 6507A and ukbus 6507B in the livery of Bluestar. Bluestar is a trade name for Solent Blue Star which was founded in 1987 and is part of the Go-Ahead Group. The area that they service area is Hampshire which includes the cities of Southampton and Winchester as well as parts of the New Forest and coastal tourist areas. 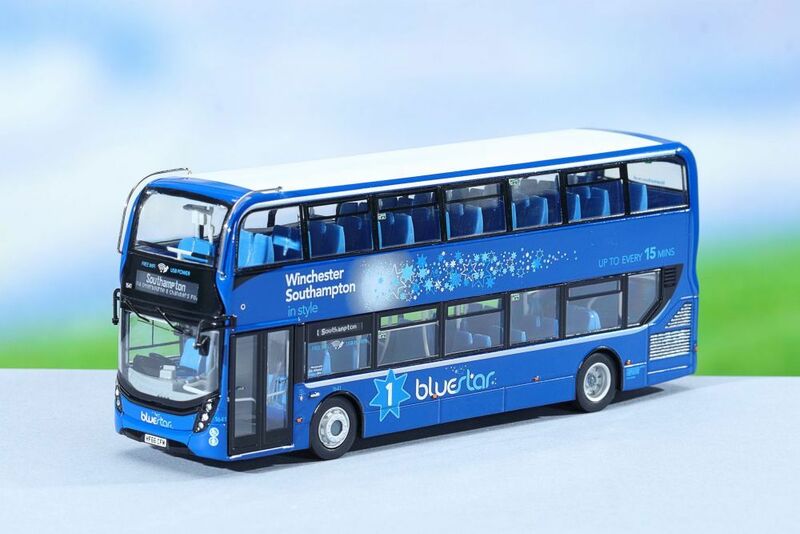 The model is based upon fleet number 1641 (HF66 CFM) which has 10.9 metre, single door bodywork and was new to Bluestar in 2017. It is liveried for route 1. The standard of tampo printing appears to be very high and the livery of the original bus has been reproduced in fine detail. As seems to be the current fashion the only difference between the two models is the direction of working. This allows the same bus to be sold in two slightly different versions. The model is a one-piece casting with gasket-mounted windows as well as twin tree protectors at the front. The front dome and curved screens are captured too. Inside there are handrails on upper deck and lower deck, and other fine details.